"The KRALOVNA long jacket is a must in our collection. Comfort, warmth and optimal protection due to its high quality of down. Its water-resistant and breathable hot melt microporous dot lamination keeps you dry from the elements and evacuates moisture vapor. The surface of the fabric is treated with a Durable Water Repellent finish (DWR). Insulation : White duck down 80/20 - Nylon bagged - 650 FP. We support the Responsible Down Standard (RDS) in our use of down. The goal of the RDS is to ensure that the waterfowl used in the down supply chain are treated Humanely. You can visit RDS website for more information. 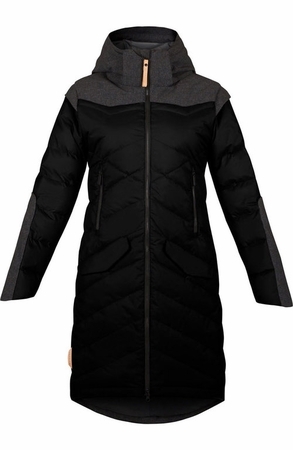 Garment made of windproof fabric, partly of waterproof / breathable fabric (upper body) and partly lined with microfleece. Critically seam sealed. Average protection against water. "